Tonight my friend Esther came over for dinner. 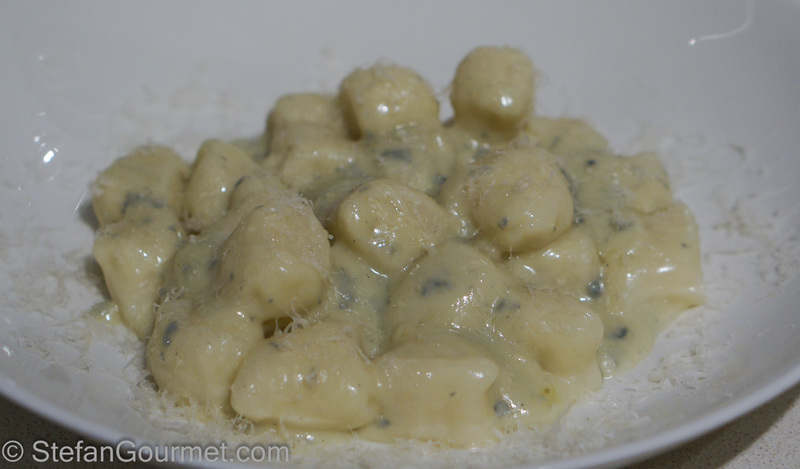 As primo I tried a lighter version of a favorite dish: gnocchi al gorgonzola. Instead of butter and cream I decided to use chicken stock. The result was not as creamy, but still delicious. If you don’t worry about calories, use cream instead of chicken stock. If you use chicken stock, please make sure it is not too salty because the gorgonzola is already very salty. When using sous-vide: peel potatoes, cut them into thick slices, seal them into a bag in a single layer and cook for 1 hour at 84C/182F. Otherwise, insert a fork into each potato a few times and cook them for one hour in the skin in an oven preheated to 175C/350F and after taking the potatoes out of the oven, peel them as soon as you can. While the potatoes are still as hot as possible, use a potato ricer to mash them. Add the flour and a pinch of salt and knead just enough to make the dough homogeneous. 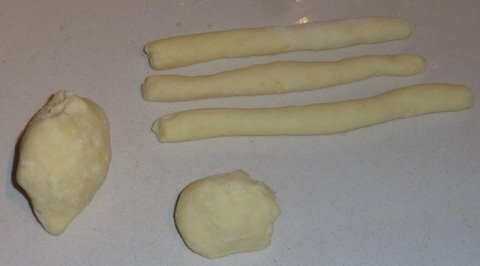 Take a piece of the dough about the size of a small egg and roll it out to a roll with the thickness of your finger. Repeat until there is no dough left. 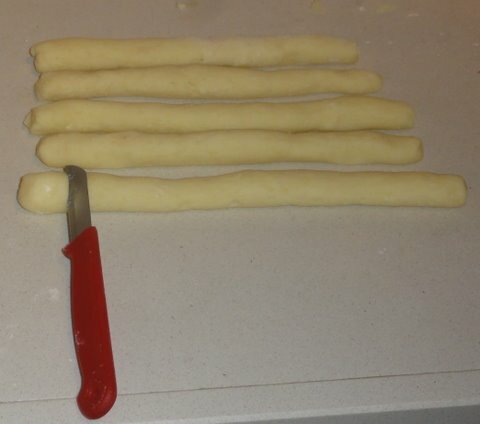 Cut each roll into 2 cm / 1 inch dumplings. 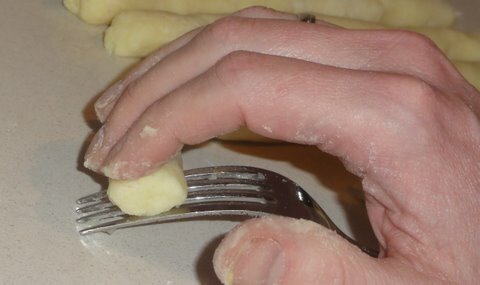 Hold a fork with its tines resting on a work surface as indicated. Slide each dumpling against the fork with your fingers to create grooves in the dumplings that will help absorb the sauce. Arrange the dumplings on a floured tray or plate. In a frying pan or large saucepan, gently heat the chicken stock or cream, add the diced gorgonzola and stir to let the cheese melt. Fill a large pot with at least 15 cm / 6 inches of water, add some salt and bring to a boil. Add the dumplings to the water. Remove the dumplings with a slotted spoon as soon as they float, otherwise they will be overcooked. Add the drained dumplings to the sauce, mix gently. Serve on warm dishes with grated parmigiano reggiano. I’ll have to give these try soon. They look great. Hey Stefan you are only one of two blogs on the entire inter-webs that sous vides there potatoes for the gnochs. I’m wondering could you elaborate on the process. Specifically, what size the potatoes should be cut up to in the bag and how full that bag should be. Also is there a distinct advantage to sous vide process over say boiling or oven baking? Cheers to having such an innovative blog post. The cooking time depends on the thickness of the layer of potatoes in the bag. For a cooking time of an hour, the thickness should not be much more than an inch or so (2.5 cm). The advantage to boiling is that by cooking sous-vide the potatoes will be drier, so you will need less flour and the gnocchi will be lighter. The advantage to oven baking is that the potatoes will cook more evenly and that you can peel them before cooking — I don’t like removing the skin of baked potatoes. There is an Italian guy who cooks potatoes sous-vide and then bakes them — I will dig into that and report back on the blog. Hi, I’m here from Chgo John’s blog, I use Biba’s recipe too and have never added an egg. Does ricing the potato whilst still hot not make it starchy? Your sauce actually looks like its got a good amount of Gorgonzola, I hate it in restaurants that the sauce is more cream than cheese. Hi Eva, thanks for visiting and taking the time to leave a comment! Several Italians have insisted to me that it is of paramount importance to rice the potatoes while they are still hot and to make the gnocchi as quickly as possible — all (female) family members are set to work when gnocchi are made for a large family meal. This is one of the sacred laws of Italian cooking that I’ve never questioned, but it is an interesting question so I will look into it. Thanks for the response Stefan, I shall surely try it that way next time. Do I like cheese? Like is not a strong enough word. More like completely obsessed with fine, artisan cheese. My love affair with cheese began when I lived in Spain in 2003-4. The link you shared is amazing – reading it now!!! Nice work. I can imagine you had to go to Europe to fall in love with cheese. In the USA you have to look pretty hard sometimes to find anything other than processed junk. I’m impressed by the shop with 800 varieties you worked at though! I believe that they only had 300 – never all at the same time, not enough turnover – that must have been a typo on my end!